Illustrates part of the Union campaign to secure newly-independent West Virginia. Military Reconnaissance in the Vicinity of Gauley Bridge Department of Western Virginia. 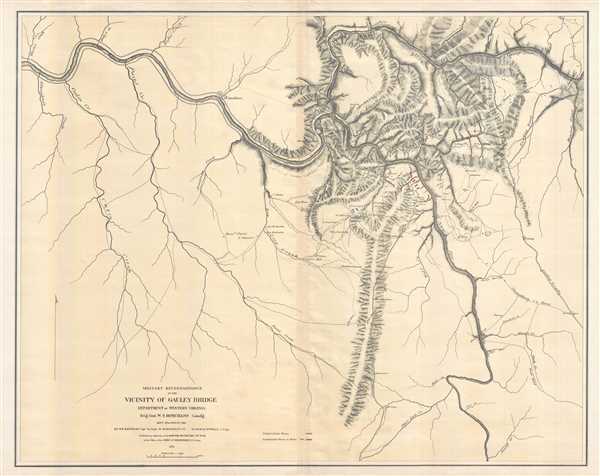 Founded at the confluence of the Gauley and New Rivers (which combine to form the Kanawha River at Gauley Bridge), the town of Gauley Bridge occupied a strategically important site in western Virginia (now West Virginia) in the fight for control of the region. Union forces also controlled the Ohio River, which allowed for easier access to the Kanawha Valley. Union sentiment in western Virginia was high, as it had voted to secede from Virginia and join the Union after Virginia opted to join the Confederacy. Several small skirmishes took place between the opposing forces over the course of the two years, but no major battles were ever fought in this part of West Virginia. This map was created by William Franklin Raynolds, William C. Margedant, and Walter Angelo Powell and published by the Army Corps of Engineers in 1879. William Franklin Raynolds (March 17, 1820 - October 18, 1894) was an American explorer, engineer, and U.S. Army officer. Born in Canton, Ohio, Raynolds was the fourth of six children to William Raynolds and Elizabeth Seabury. Raynolds entered the United States Military Academy at West Point on July 1, 1839 and graduated fifth in his class of thirty-nine in 1843. Initially commissioned as a second lieutenant and posted with the 5th U.S. Infantry, he was soon transferred to the U.S. Army Corps of Topographical Engineers. His first assignments were as an assistant topographical engineer involved in improving navigation of the Ohio River and then mapping the northeastern boundary of the United States. During the Mexican-American War, Raynolds served in Winfield Scott's campaign which marched overland from Veracruz to Mexico City. After the war and during the occupation, Raynolds and a few other engineers decided to map and explore the nearby mountains. He and his party are credited as being the first to summit Pico de Orizaba, the tallest mountain in Mexico and the third tallest in North America. After returning from Mexico, Raynolds again took up the project of surveying the northern border of the United States. This project, however, did not last long, as Raynolds was soon assigned a project to develop water sources for Washington, D.C. and then was tasked with surveying and mapping the shorelines of the Great Lakes while identifying potential lighthouse locations. In 1857, he designed and supervised the construction of lighthouses along the Jersey Shore and the Delmarva Peninsula. In early 1859, Raynolds was given the task of leading an expedition into the Yellowstone region of Montana and Wyoming with the goal of determining, 'as far as practicable, everything relating to...the Indians of the country, its agricultural and mineralogical resources...the navigability of its streams, its topographic features, and the facilities or obstacles which the latter present to the construction of rail or common roads.' Raynolds and his party would spend the next two years in the West and was the first federally funded party to enter Jackson Hole or observe the Teton range. The American Civil War, however, would keep Raynolds from presenting his findings until 1868. At the outbreak of the Civil War, Raynolds made his way back to Washington, D.C. where he was named chief topographic engineer of the Department of Virginia in July 1861. As no suitable maps of Virginia existed for military use, Raynolds and his team immediately set to work surveying and mapping the part of Virginia that remained loyal to the Union. This part of the state would become the State of West Virginia in 1863. In January 1863, Raynolds was put in charge of the defense of Harper's Ferry, West Virginia, but by 1864 hostilities in the West, particularly with the Sioux Indians, made Raynold's knowledge of the Great Lakes more valuable than his understanding of the defenses of Harper's Ferry. He was transferred in April and would not see any more combat for the rest of the war. After the war, Raynolds remained in the Army Corps of Engineers and worked on various projects, including improving the navigation of the Arkansas, Missouri, and Mississippi River, building harbors, and overseeing lighthouse construction. Raynolds retired from the Corps of Engineers in 1884, after a forty year career. We know very little about Raynold's private life, however, we do know that he married young and he and his wife did not have any children. invented method of duplicating maps in the field by which all corps, divisions and brigades, as well as individual regiments when acting or moving alone, were furnished at each camp with maps of the surrounding country on the march, with those showing the roads, streams and other military features of country in advance. These maps were printed on cloth, often on a handkerchief and distributed in great numbers. Photographic duplications of charts gave valuable information as to camp grounds, water forage, kind of roads and trails and their condition. Every organization down to brigades had a topographical engineer whose business it was to gather daily all the information possible of the country where the troops halted, and of the region in advance, and reported it in the evening to the next superior headquarters. At army headquarters Capt. Margedant's force consolidated the topographical notes received, and the next day maps and charts containing everything ascertained the day before were in the hands of all commanding officers. Because of this service, Margedant came to be known as 'the pathfinder of the Army of the Cumberland.' Margedant then served on the staff of General John C. Fremont and saw combat in multiple battles. Margedant remained in the army until late 1864, when he fell seriously ill from typhoid fever. During his time in the army he participated in thirty-six battles and engagements, from West Virginia through the Shenandoah Valley, Tennessee, Georgia, and Alabama. Margedant remained active after the war, becoming a member of the Grand Army of the Republic and a staunch Republican. He was a figure in the community, a liberal giver of both time and money. He also served as the president of the Pioneers', Soldiers' and Sailors' Permanent Monument Association. Margedant married Caroline Son on January 28, 1864, with whom he had nine children. Walter Angelo Powell (January 6, 1829 - May 21, 1911) was an American architect and engineer. Born in Baltimore, Maryland, and received an education in Baltimore and Philadelphia in medicine before moving to New York City to study architecture. After five years of study, he worked as an architect in New York City for a time before returning to Baltimore, where he studied civil engineering and worked with on topography for the Baltimore and Ohio Railroad. he then became associate with Robert Mills, an architect of public buildings in Washington, D.C. With Mills, Powell worked on designs for the extension of the United States Capitol, the Washington National Monument, the Marine Hospital, and other public buildings. He then moved to Cincinnati, where he opened his own firm, and was successful until the outbreak of the American Civil War. He then was convinced by General Rosecrans to join his staff in Virginia and served through the entire war. He was in twenty-four engagements and planned and built the fortifications at Harper's Ferry, among other locations. After the war, Powell moved to Nashville, Tennessee and became an engineer with a large mining company. After losing all his money speculating on oil wells, he returned to Cincinnati, and, finding the city 'full of architects', he turned his sights to Missouri. He arrived in St. Joseph, Missouri, in 1866, and developed a reputation as one of the best architects in the West. Powell married Celia Gillmyer in 1857, with whom he had seven children. Very good. Even overall toning. Verso repairs to centerfold separations. Closed minor margin tears professionally repaired on verso. Blank on verso. LOC G3894.G35S5 1879 .R3. Stephenson, R. W., Civil War Maps; an Annotated List of Maps and Atlases in Map Collections of the Library of Congress, 695. OCLC 53002605.